KOTRC members enjoy two flying sites in Los Angeles County. The Whittier Narrows recreation area is one of the two flying sites located in Los Angeles County and is the location for the KOTRC sponsored contests during the year. Whittier Narrows is part of the Los Angeles County Parks and Recreation department and is located in South El Monte, California. There is a $6.00 per vehicle entry fee. The Control Line flying area has three fully paved flying circles with one circle fully fenced for safety during speed events. A permanent carrier deck with a paved takeoff and landing area and a paved pilots area is available. The remainder of the carrier circle is over grass. Grass Circles are available for combat. The small circle in the upper left is the tether car track, one of the few left in the country. The Los Angeles County Whittier Narrows Recreation Area has been in existence a long time. The model flying field, and especially the control line facility, is there primarily because of one individual. In 1957 John Gudrangian lived in the vicinity of Western and Manchester Avenues in the city of Los Angeles. He had a fifteen year old son, John Junior, that was active in control line flying. Around 1963 the family moved to a location West of the Whittier Narrows area, near the town of El Monte. There were no acceptable sites for control line flying near there and flying sites in general were informal arrangements that were dying out fast. John began an energetic pursuit of the idea to put such a facility in the Whittier Narrows area. He was a painting contractor by trade and, because of this, had numerous contacts in County Government. He used them to understand the appeals process and to present his material in the best way. He made numerous presentations and visits and had the help of Los Angeles County control line clubs. The presentations sometimes used the phrase "Some place where a boy can go to fly his model airplane." In a few years the idea was accepted and the area for the current facility reserved, and the flying circles and cage constructed. Primarily because of this man, the site is one of the premiere sites in the Western Hemisphere for control line speed and also among the best for control line racing. The Sepulveda Basin is located in the San Fernando Valley of Los Angeles County near where the 405 freeway and the 101 freeway meet. The flying area is just west of the 405 freeway and is entered from Woodley Ave. between Victory and Burbank Boulevards. The entry to the site is located on Woodley Ave. between Burbank Blvd. and Victory Blvd. Look for the sign to "Apollo XI field" on the west side of Woodley Blvd. 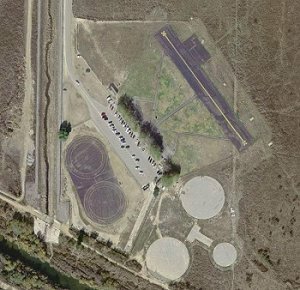 The main Control Line flying area has two fully paved flying circles with a grass next to the circles. Bring your own shade as there is no shade close to the C/L circles. 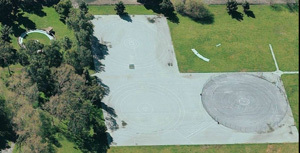 Three additional paved circles are available for contests, but are used at other times by the helicopter flyers. The two main control line circles are the dark circles on the left. The three light circles are primarily used by the helicopter flyers except during contest days. The RC runway is at the upper right.